Delete Comments Without Trash Can Icon! ~ The Blog Doctor. You are here: Home > Comments > Delete Comments Without Trash Can Icon! Delete Comments Without Trash Can Icon! To delete a Blogger comment first click the '4 COMMENTS' link below the post on the Main Page to open the comments page. Then click the Trash Can icon below the comment. 1. Refresh the Cache repeatedly. 3. Check that you are logged in at Blogger.com. 4. Temporary disabling of Firewall or Security software on PC. Copy the 'BIG_NUMBER' at the end of the url. That is the ID Number of the blog. Copy the 'BIG_NUMBER_2' at the end. In above replace 'BIG_NUMBER' with the Blog ID number from Step 1 and 'BIG_NUMBER_2' with the Comment ID number from Step 2. Then copy the whole link and paste in address bar of your browser and hit Enter key on keyboard. You will see the confirm Delete Comment screen. Check the box to Delete forever and OK it. Now you will need no Trash Cans to delete comments! when we click on the menu content or the lebles in your blog, the result is not a new blog, but just a post from this blog only,isnt it? so is it true that what you do is you have only one post for one page? In Blogger if you have Layouts template than each post is on it's own page. The Main Page carries as many posts as you want. See Pages in Blogger. You are the greatest. I have been looking for this for 2 days and trust me I am smart with Google :) With your help I finally managed. 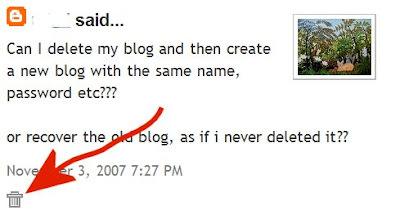 Select the comment on the blog site then select "source" ("view page source" in Firefox) and copy paste the link in your browser as http://www.blogger.com/delete-comment.g?blogID=xxxx&postID=xxxx. Then delete "amp;" and select Enter. This is quicker and just an alternative. thanks for the useful information.i'll bookmark you! Thanks, this was quite helpful. Still can't get the trash icon to come back though, but at least I got read of the comment I wanted to delete. This still doesn't help. The timestamps aren't linked, so there's no "copy shortcut" option when I right click. Thanks anyway, though. Are you using Firefox 3 Browser? I can see the links on the comment timestamps. Which comments do you want to delete? I can't get this to work. I keep getting an error message "bX-jlna93"
Does this work if you posted a comment as a guest without a blogger account? I cannot remove my comments. Try it out. The bx errors are due to connectivity issues. Try connecting from a broadband connection or at less busy times. BUT commenter John's DID! so thanks to all of you :) freakin' love the internet. This question is related although I have no problem with completely deleting a comment. I would like to know how to delete or edit something out of a comment- an e mail address, for instance? Is it possible through Blogger? Have a look at List of No Can Dos in Blogger. This post was very helpful, however I still am having a problem. My comment was deleted, but the time stamp and link back to my blogger profile remains on the blog post. Can this be deleted? Thanks!